An Amazon adventure set in the wilderness of Brazil, Journey to the River Sea is filled with mystery and memorable characters. It is 1910 and Maia, tragically orphaned at thirteen, has been sent from England to start a new life with distant relatives in Manaus, hundreds of miles up the Amazon. She is accompanied by an eccentric and mysterious governess who has secret reasons of her own for making the journey. 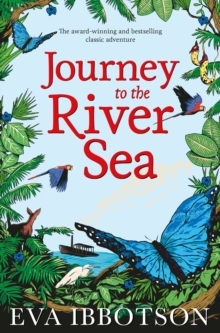 Both soon discover an exotic world bursting with new experiences in Journey to the River Sea, Eva Ibbotson's highly colourful, joyous adventure. Winner of the Smarties Gold Medal. Shortlisted for the Carnegie Medal and the Whitbread Award.